Made Fair Trade in Indonesia Cast and hand-polished in white brass Ring 1.25" inside diameter This stunning elemental design which is closely based on a Hmong earring from the Golden Triangle which constitutes Thailand, Myanmar, Laos and Vietnam. For the Hmong, silversmithing is a male occupation but it represents women's wealth. 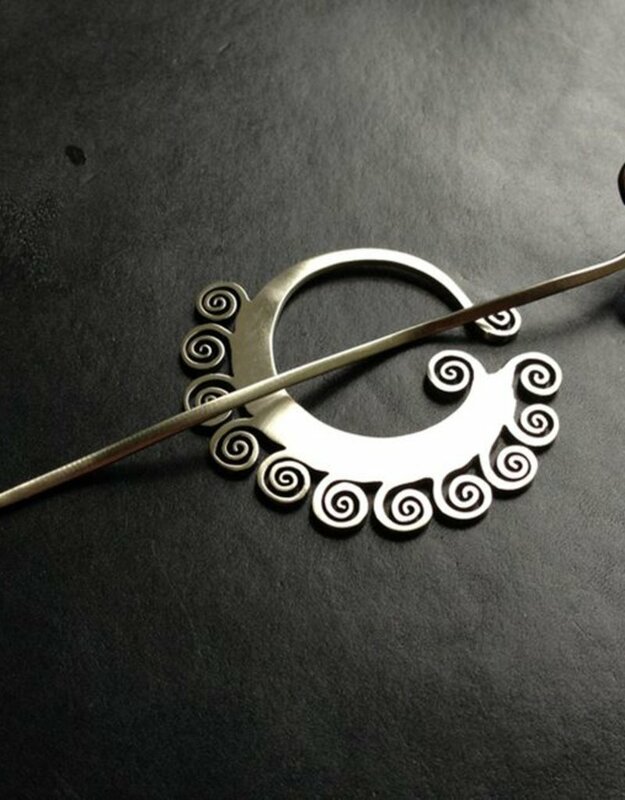 Silver is passed down from mother to daughter. Daughters take their jewelry with them when they marry and it remains their exclusive property for their entire lives. During festivals and ceremonies women adorn themselves so heavily in silver a woman's wealth can be discerned just by looking at her. 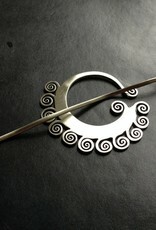 The spiral motifs in the coil stick and shawl pin are associated with infinite time, endless movement and boundless energy.